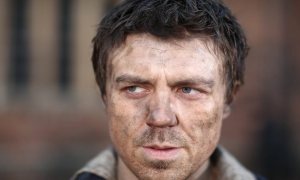 Andrew Buchan has spoken about his role in The Great London Fire drama series by ITV. He says he wasn’t aware of too much about the fire except of course that it happened. By playing in The Great London Fire he learned how devastating it was and what it was like to live through it. The flames used in the drama were not computer animated — no CGI — just pure heat, pure flames. How more realistic can it get? Andrew Buchan is proud to be part of the series and is learning history through his involvement with it. I’ve loved Buchan in every role in which he has embodied some kind of profound seriousness – Broadchurch, The Honourable Woman (OK, not so much in Cranford, but loving Cranford is something you’re either born with or not, like a sense of smell). His “seven and a half hours of grieving”, as he calls Broadchurch series one, sealed him as that archetypal stand-up guy. Maybe he wasn’t always faithful, but he had some core dependability, the buck-stops-here quality of the Everyman-turned-hero. Even though Buchan’s character was much darker and more complex in The Honourable Woman, he carried that same resilience; he never asked for any of this, but by God, he’ll rise to it. So twice (I also interviewed him just before the Baftas) I have been perplexed by how different Buchan is in real life: puckish, self-parodying, parodying everyone else, often funny for reasons I don’t understand and couldn’t describe – they’re just there in the delivery. It’s the polar opposite of Hugh Grant syndrome, in which every role he played got a little bit more like himself. Buchan, 35, plays so much against type that even the way his face moves, in real life, is novel. He’s like an older brother; arch, clever, always sniffing the air for comic potential, put on earth to yank everyone’s chain all day long. He’s not very amused, though, by my first question, which is: isn’t the Great Fire of London a bit of a surprising subject for a drama? All the best stories last because they’re driven by human folly and passion and greatness, qualities that can unite people across any number of centuries. Whereas this… was just an accident. The context was thick with conspiracy; the King and his courtiers were unfeeling, as aristocrats so reliably are. But there’s not much to learn from the main event, except it’s unwise to build houses out of wood. You’ve got to hand it to the fire- it’s exciting to watch. A nerve-racking scene as Farriner tries to get his children onto the next-door roof turns out to have been filmed with authentic flames, genuine 100 per cent heat. Andrew Buchan has not disappointed with his role in the Great Fire of London, but I bet he will be looking for a much cooler work environment in the next role he plays. The flames used in the drama were real, not some fake computer animated fires we are so accustomed to. ITV is concentrating on the details, making the Great Fire of London an excellent series to watch.